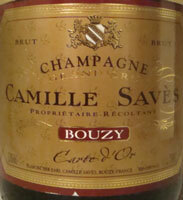 Camille Savès is in Bouzy, known for its Pinot Noir, and the domain has 11 hectares of Grand and Premier Cru vineyards in Bouzy, Ambonnay and Tours-sur-Marne. A family run Grower Producer currently run by the fourth generation, they are headed by Hervé Savès who took over from his father Camille in 1982. Camille Savès is still involved. Wines are fermented in enamel lined steel tanks, then transferred to steel tanks and neutral oak for ageing, before the 2nd fermentation in bottle. The wines rest for four years or longer on the lees, and no malolactic fermentation is allowed. I purchased mine from The Rare Wine Company and Premier Cru although other retailers also have the elixir known as Camille Savès. Oh yes, I am a fan. Camille Savés NV Carte Blanche: 75% Pinot Noir and 25% Chardonnay. 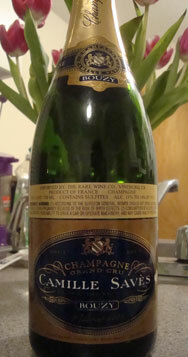 An excellent value and wonderful entry level Champagne. 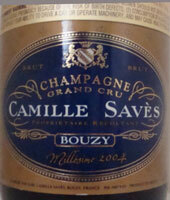 Camille Savès NV Carte d’Or: All Grand Cru fruit from Bouzy, 75% Pinot Noir and 25% Chardonnay. More "interesting" than the also excellent Carte Blanche. Tasting note below, which basically says "Wow!" Camille Savès Vintage Brut: Their vintage wine, 80% Pinot Noir and 20% Chardonnay, 100% Grand Cru from the Savès estate in Bouzy. Long aging on the lees, usually 6-7 years, prior to bottling. 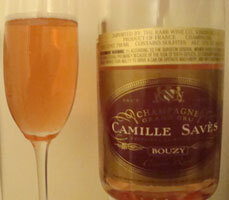 Camille Savès NV Brut Rosé: This Rose is all Grand Cru from Bouzy, with 10 -12% still Pinot Noir added. The top seller in the US. Tasting note below. Very creamy yet light and rich. Wonderful on the tongue with lots of long tones. Tangerines, oranges, and pomegranates. Very crisp and precise, and absolutely delicious. This stuff rocks. The 80% Pinot Noir and 20% Chardonnay shows, and this wine tastes quite "Bouzy": powerful and delicate, dry and rich, with lots of minerals. Can I drink this every night please? 100% Grand Cru grapes from Bouzy, 60% Chardonnay and 28% Pinot Noir with 12% still Pinot Noir added. A hearty pink salmon color with a touch of copper and plenty of bubbles. On the nose, first raspberries, some delicate strawberries, and absolutely some nice chalky minerality. Maybe a touch of peach? Some spiciness. Very creamy and long on the palate. Smooth and warm, absolutely delicious. Powerful yet delicate, just like the Millesime 2002. A spicy and hearty minerality as it warms. Juicy and fruity, in a dignified way, as it warms even more.. The nose is fresh bread dough with orange citrus tones, chalk and minerals. A creaminess emerges after about an hour and the bread dough dissipates. Very fresh and brisk on the palate, with fresh orange juice (no pulp! ).Some lovely lemon after about 15 minutes of breathing, maybe just a tinge of exotic tropical fruits as well. Some pineapple. Very nice. Tasting Note: Camille Savès Carte d'Or - February 2013 - rated A- and shockingly tasty. Bound to be a crowd pleaser. A big rich mouth watering Champagne! Big, warm and friendly, Yowser! Nose - chalk and cream, lemon, orange, and very rich. Fresh cut apple and minerals as it breathes and warms. On the palate there is immediate juicy orange and this wine is full bodied and delicious. Lemon. Tasty. Very much Pinot Noir from Bouzy. Apple as it warms. Its Grand Cru heritage shines through clearly.